Your Check Engine Light is on? Just simply plug Vgate Maxiscan VS890 in, get your code and decide whether you can fix the problem yourself or if it requires a mechanic’s expertise. Not only does the VS890 identify the problem with your vehicle, but it also shows you the possible reasons why there was a problem to begin with. 3.1 What Makes The Vgate Maxiscan VS890 Special? 4 Who Should Buy the Vgate Maxiscan VS890? 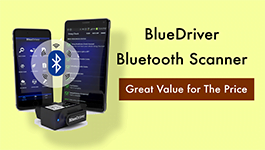 Vgate is known as one of the most popular and reputable manufacturers of OBD scanners with several different products on the market for consumers to choose from. When you have the Vgate Maxiscan VS890, you’ll have in your hands an inexpensive option to get the job done effectively. Today, I would like to discuss with you why the Vgate Maxiscan VS890 needs to be considered by every vehicle owner. Limited Code Information. No in-built DTCs Lookup library. Bottom Line Vgate VS890 is built for any car owners. 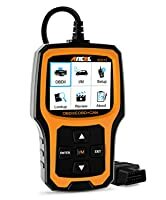 ANCEL AD410 OBD2 Scan Tool is a great choice for beginners or average car owners. Autel Al319 suits beginners who want to turn off the CEL and do simple diagnosis. What Makes The Vgate Maxiscan VS890 Special? The VGate Maxiscan VS890 will identify the problem with your vehicle. Then it shows you the possible reasons why there was a problem, to begin with. As a result, you can know whether the issue was caused by you or just a result of parts becoming faulty over time. With just a few buttons on the device, even the casual user can figure out how to use the VS890. The easy-to-use design combined with the detailed information it provides makes the VS890 an attractive option for any vehicle owner. Plus, the Maxiscan VS890 will pay for itself in just a few uses, and sometimes a single use. When you can run the scan yourself, it saves a lot of time and money. It’s a reliable device that gets to the root of the issue. Instead of having to visit a mechanic, you can find out what’s really wrong with your vehicle. 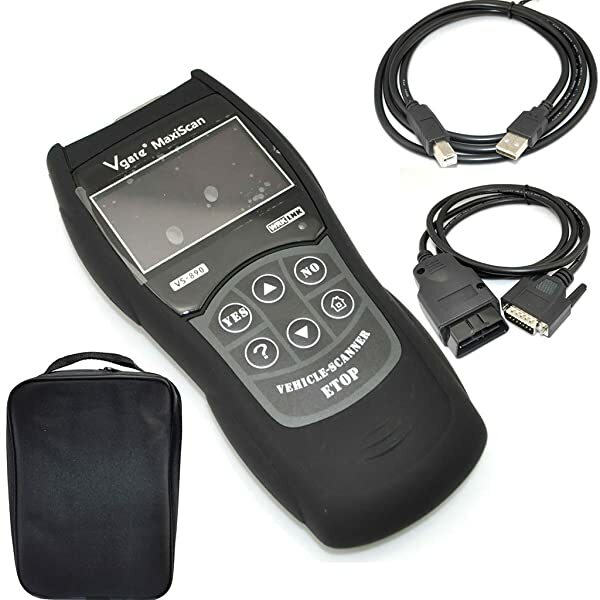 The Vgate Maxiscan VS890 gives you the opportunity to fix the problem in your vehicle yourself. This scan tool significantly reduces the amount of time it takes for a mechanic to work on it. When you can accurately diagnose the issue before even taking it to the mechanic, you can save an hour or two in labor costs. This also means that you can save several hundred dollars. The 3” LCD display screen is plenty large enough for you to read the codes the device gives you. Whether you have a dark shop or are in direct sunlight, you won’t have any problems reading the display. This Maxiscan VS890 is also vibration proof. So if you have it sitting on spots with intense vibrations, you won’t have to worry about damaging the device. 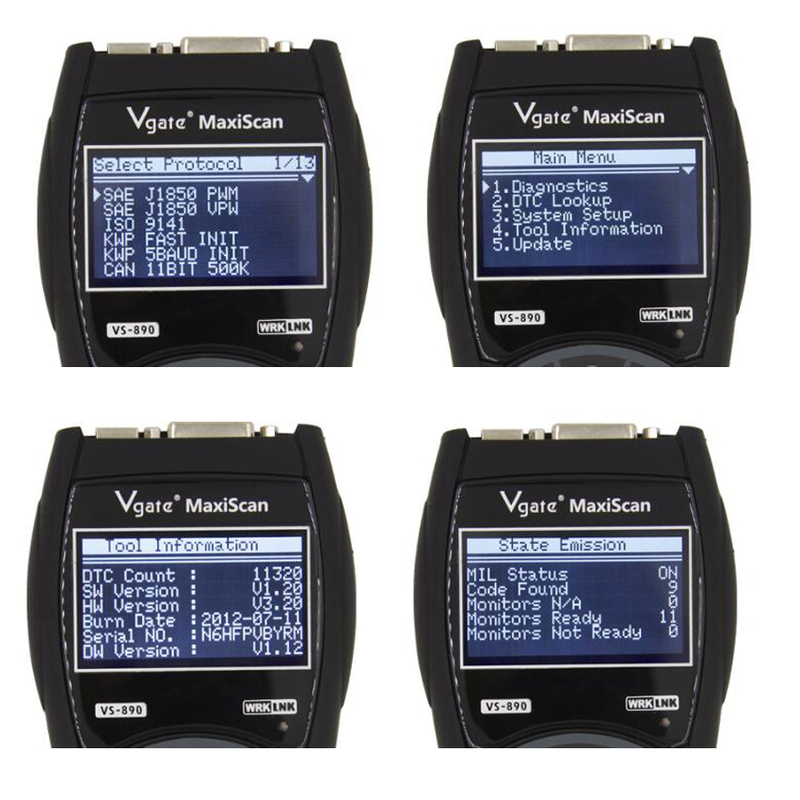 Vgate Maxiscan VS890 supports several diagnostic functions. One neat thing about this device as well is it offers multilingual options. So whether you speak English, Spanish, Korean, Japanese, Portuguese, German, Hebrew, Italian, French, Chinese, Dutch, Finnish or Danish, the Maxiscan VS890 has you covered. And speaking of versatility, the Maxiscan VS890 supports several OBD protocols, including SAE, CAN, VPW, PWM, ISO or KWP. It works on most vehicles made in 1996 and later, as long as the vehicle is OBDII compliant and made in the US, Europe or Asia. The Maxiscan VS890 is also reasonably sized and weighs just 1.5 pounds. This means you can easily store it in your toolbox so it’s always accessible in case of an emergency. There aren’t many things not to like about the Maxiscan VS890. However, as with many comparable OBD scanners, this one isn’t compatible with all vehicles. You’ll need to read up on it before you purchase to ensure it will work with your specific vehicle. Also worth noting is that it is not compatible with the Windows 10 system. You should keep that in mind if that’s the system you operate on most often. From a functionality standpoint, though, there really isn’t anything to complain about with this OBD scanner. The most complaints come from people who didn’t do their homework to see if their vehicle was compatible with the device. As long as you verify that ahead of time, then there really aren’t any cons. Who Should Buy the Vgate Maxiscan VS890? This OBD scanner is a dream for the average DIY’er, but not so much for the experienced mechanic. Anyone who likes to work on cars as a hobby will love this scanner. 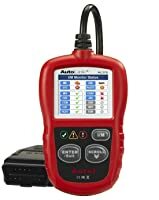 You can actually learn a lot from this scanner since it will tell you what is wrong with the vehicle instead of just giving you a code and making you figure it out yourself. Anyone who is on a budget will appreciate the versatility that this scanner offers. And the fact that it will essentially pay for itself makes it even more attractive for the person who likes to work on vehicles recreationally. Now that you are familiar with what the Vgate Maxiscan VS890 can do for you, you can make the best decision on whether it’s right for you. Again, the main thing to do first is to do your homework to make sure your vehicle is compatible with the device. Once you’ve determined that it will work, there’s not a better investment you can make for your vehicle. It’s great for the average DIY’er who likes to diagnose problems and maybe even fix problems themselves. Mechanics may not wish to purchase this device because it is limited in the amount of information it can provide on a single screen. But it is suitable as a backup option in case the main OBD scanner breaks or stops working. 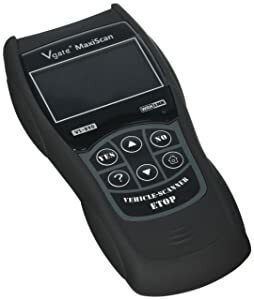 However, for anyone wishing to save a few dollars here and there and learn more about their vehicles, the Vgate Maxiscan VS890 will save you some trips to the mechanic shop. Don’t wait for something to go wrong with your vehicle before making the investment.